Before you buy your dream property in Turkey our local offices will have already carried out initial checks, land title and ownership, debts against title, planning and constructions approvals, Iskan (Habitation Licence) and check all licenses are in place. We are specialists in buying property in Turkey. Below is some basic general information on how the buying process works, costings do vary from area to area and seller to seller. Firstly choose a suitable property which meets your requirements. Once the deal is negotiated, between buyer and seller, you need to have this put into a legal sales contract valid in Turkey. This will outline who is responsible for what, when funds are to be paid and to whom. This is a very black and white contract, this will be drawn up by the lawyer. An initial holding deposit will be required to remove the property from the market, followed by the balance of deposit, after this you may pay the balance in one or two instalments, this will be negotiated at the inception of the contract. The final balance will be when the new deeds are ready for transfer into your name. Other than the initial lawyer’s fees, all other fees, ie deed costings, taxes, electric and water transfers and connections, will be needed at the final transfer stage when deeds are ready for issue. Once the deeds are ready for issue into your name you can either return toTurkeyto sign for them yourself, or you can at this stage give power of attorney for someone to sign them on your behalf. Any special conditions, ie extras being supplied by a builder will be added to the contract, or that a resale comes fully furnished. Always use a lawyer from the Foreign and Commonwealth List of Lawyers – most clients will use one who has been previously used by other clients in the area. When in the Lawyers office at the contract stage, you will be given all the relevant copy documents to retain, ie existing Deed, proof that the person selling is the legal owner, and this can be backed up with company documents if a builder, or power of attorney for a private seller. You should leave the lawyers office having had all the legalities fully explained to you and happy with your purchase. You will also have time to ask any questions to the lawyer whilst they are fresh in your mind, don’t forget he is your representative. 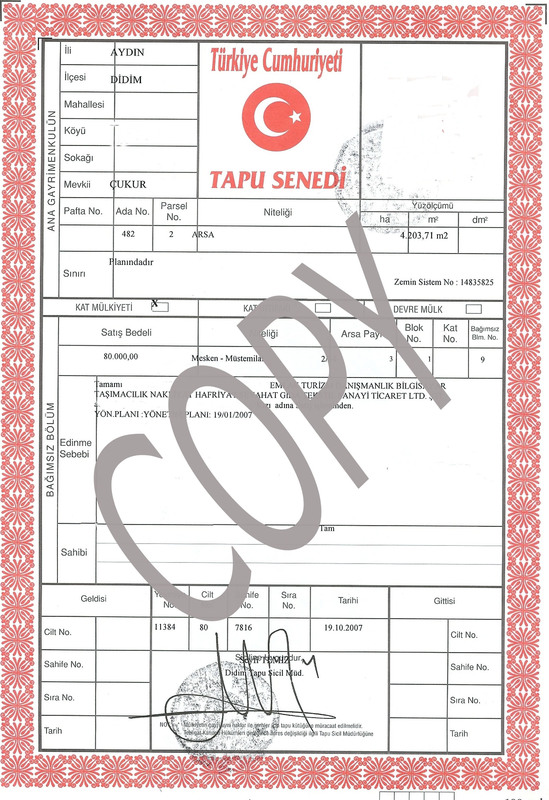 The contract will be in Turkish as well as English and will be translated to you in the lawyers office by a legal translator who will also sign the contract as translated and agreed with both parties. Once the legal side is completed, we will arrange to get you Turkish Tax number (ID number) for you in turkey, this will allow you to purchase, plus open a bank account, residency, and insurance. You will leave the resort knowing all the facts and confident in your purchase.